Have you heard? This is a great day for vaccine safety advocates across the nation as we applaud President-Elect Trump’s appointment of Robert F. Kennedy, Jr. to head vaccine safety and scientific integrity! He is more than qualified to address the many concerns that parents have had for decades. This is a game changer in the pro-safety movement! Red is for Stop – think about it and do NOT vote for them. Partial listing below for key races – more complete information on google docs link (above). Late this afternoon, the Oklahoma House of Representatives voted to override the governor’s veto, but not by a sufficient 2/3 majority vote. As a result, the Oklahoma medical community and Oklahoma public schools can continue to force children to be immunized without telling them what is being injected into them. 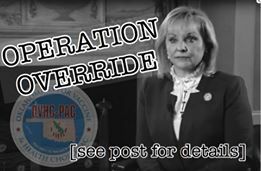 It’s override time Oklahoma! Email samples available online. Add your story and tell the legislators why this is important to you. Legislators appreciate personal emails. Let’s “Be the Voice for Vaccine Choice”, Oklahoma! Special thanks to Liza Longoria Greve, Casey Albertson Ohlsson & all who fought for Oklahoma Parent’s & Children’s Rights in Vaccines. Passed on its way to Governors desk! (Without Yen’s amendments!) The amendment to take our exemptions was tabled unanimously and the second one regarding VIS being enough was struck down. Thank you Senator Nathan Dahm and Rep. Randy Grau for authoring the first bill of its kind to empower parents with ingredients to help avoid allergic reactions and other balanced information prior to vaccinations. We are blessed to live in such a great state that values parental rights and informed consent! Editor’s note: Join LOT the third Thursday of every month at Chimi’s Mexican Restaurant, 1304 E 15th St Tulsa, OK 6pm. Vaccine Security? Dr. Heather Revelis MD is today’s guest speaker at the Tulsa County Republican Men’s Club. Her medical presentation covers the vulnerabilities in many of today’s 60 vaccines offered in the name of “public health”. Pharmaceutical companies are pushing for more mandates and devising new claims of protection, if we would just order all of our population to be forced into getting these expensive drugs. "Nothing is easier than spending the public money. It does not appear to belong to anybody." Please use the search box at the top to look for something specific by keyword(s). Explore the very top tabs for site specific information. Activist tabs just below that are where county maps and issues topics are located. The home page changes with updates from our trusted contributors via feeds. The goal of this site is to provide a snapshot of what is happening with the Oklahoma Grassroots who are working for life and liberty on a daily basis. OKGrassroots is an independent grassroots network. Our efforts are all volunteer and first amendment protected. Feed content permitted does not imply an endorsement, but does carry with it a trusted (hopefully) reciprocal relationship in the political arena. For more information please see our About Pages (top tab). For some reason the Wayback Machine does not work with the Safari browser. Chrome works fine. As of March 1, 2019 the Wayback Machine is working again with Safari browser. Thanks Internet! And again as of April 1, 2019 the Wayback Machine is not working again with Safari browser. Since it seems sporadic — if it fails for you simply try another browser! Copyright © 2019 OKG News. Powered by WordPress and Stargazer.